Our 12,000 sq ft studio is furnished with professional ceramic equipment and includes gas and electric kilns, potters wheels, slab rollers and much more. We offer a full range of classes from beginning to advanced in hand-building, wheel throwing, sculpture, mold-making, slip-casting and glaze calculation. Most classes meet twice a week for nine weeks and provide our students an opportunity to build new skills, refine current skills and develop their artistic voice. Many classes include open studio time to work on your projects. Your first bag of clay is included in the price of the class. Additional clay may be purchased through the studio and includes all glazing and firing costs. Most class work is fired in cone 10 reduction unless otherwise specified. Click here for more information or to register for adult classes. We also offer workshops with renown visiting artists from around the country. Join us at the AMOCA Ceramics Studio for workshops and demonstrations that will inspire your ceramic practice. Throughout the year we invite artists from around the country and locally that will teach a variety of techniques to expand your knowledge with clay. Click here for more information or to register for adult workshops. Curious about throwing a pot on a wheel? Maybe try your hand at hand building a personalized mug? Mix, mingle, and meet up with other folks that want to let loose and tap into their creative sides. 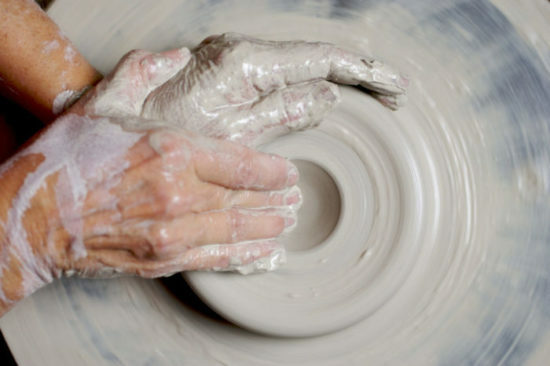 In these one-time clay experiences, there will be a theme to the clay project. Join us for a fun, new experience with your friends! (Ages 18+). Click here for more information or to register for a Teaser Class.